The iconic Breitling Navitimer family expands with a completely new collection of aviator movements: the Navitimer 8, with the B01 Chronograph as its centerpiece. 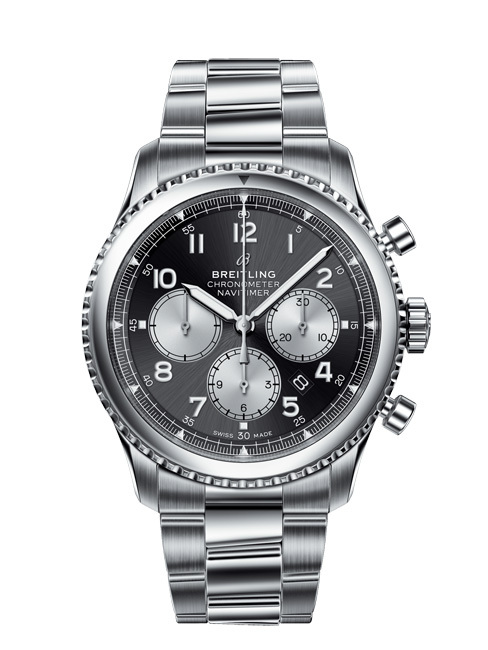 This automatic watch is powered by the Breitling Manufacture Caliber B01, with a ratchet chronograph with vertical coupling and an impressive power reserve of more than 70 hours. COSC certified and with a 42 mm dial, this watch comes in a steel finisch with a black or blue plate, or in a red gold finish with bronze plate. Both models feature striking contrasting displays and a transparent sapphire back. 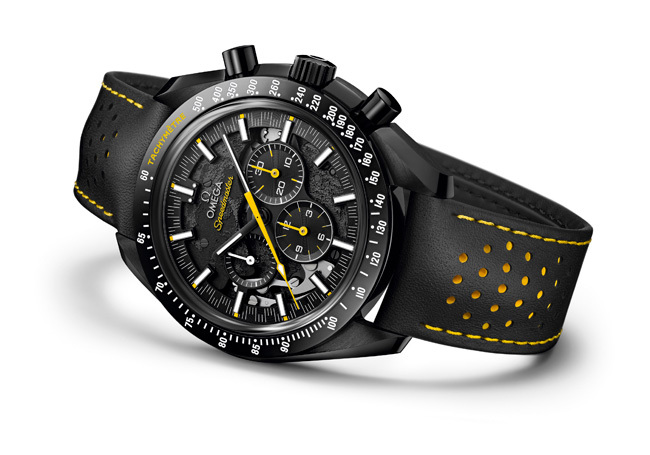 50 years after the Apollo 8 mission to the moon, Omega comes with a new Dark Side of the Moon watch, made entirely of black zirconium oxide ceramics with a yellow coding in the hands of the chronometer, which presents a fascinating contrast to the dark color of the watch. The tachymeter and the crown are filled with Super Luminova, and the black with yellow theme continues in the strap, clearly visible thanks to a pattern of micro-perforations made with a cutter. 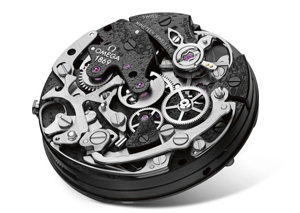 The famous Moonwatch caliber of Omega should be seen, resulting in an openwork skellete dial. With the help of laser ablation, realistically-looking images of the moon surface were applied to the anchor and main plate of the black watch. Just like the moon, the watch also has two unique sides: the slightly lighter color of the dial represents the moon's surface as we can see it from the earth. The dark back of the watch then conjures up images of the dark side of the moon that only astronauts can ever observe. Few people have had the fortune to view this mysterious side of the moon up close, but wearing an Omega Speedmaster Dark Side of the Moon Apollo 8 provides an almost tangible connection with the history of moon travel. 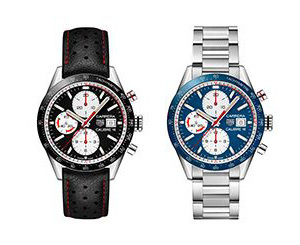 Tag Heuer celebrates the 55th birthday of its iconic Carrera watch, launching two new versions in a sporty look: 41 mm diameter, available in black and blue and powered by a powerful Caliber 16 chronograph, with red hands and white counters that subtly refer to the connection with motor sport. Inspired by the 70's design, a white 60-second division sits on the edge of the dial. As the motor sport is indeed evolving rapidly, the demand for an extremely acuurate and cleary visible time measurement keeps increasing. Add to that the ceramic bezel with tachymeter, and these two models are true motorsport watches. The two available straps complete the sporty yet vintage look: black perforated leather with an elegant red stitching for the black model, and a comfortable steel strap for the blue version.